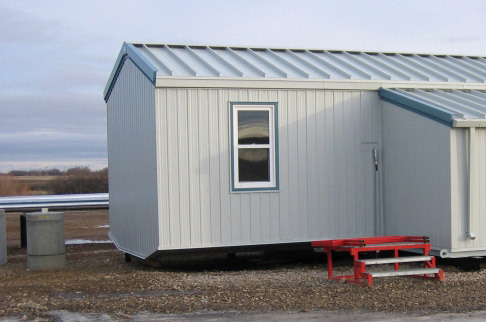 Oilfield Trailers We ship windows for oilfield buildings everyday! Ask about our dealer rates and stock sizes. • Our aluminum trailer doors are made with TIG welded 45∞ corners. • They have zinc coated hinges with vinyl storm cover. • Our trailer doors are made with all corrosion proof materials. • They have insulated panels boasting an industry leading R13 rating. • Our aluminum doors are easy to install, all you need are screws to fasten them. • Wire or glass insert options are available. • Custom pre-drilling options offered for any type of hardware. • Reinforced closer blocking available. • The aluminum windows are reasonably priced for any budget. • The windows are low maintenance and durable. • The windows open and close quietly and with ease. • The window frame and sash come in an attractive white, brown or mill finish. • The windows have an energy efficient design with weather‐stripping and interlocking rails. • The flanges are designed specifically for fitting in insulated panel buildings. • Glass options including industrial wire, sealed units and laminated/tempered safety glass. • Quick fabrication times and skilled packaging to be shipped anywhere in Canada. Aluminum windows are a low maintenance choice that will fit any budget. They are quality windows, designed and manufactured for years of reliable performance and smooth operation. The durable aluminum window frame and sash feature an attractive finish in your choice of white, brown or mill. 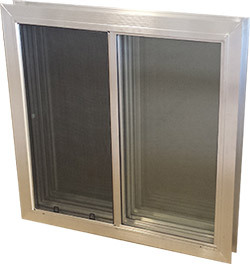 The energy-efficient design of these aluminum windows includes features such as a double weatherstripping and interlocking meeting rails to keep wind and water out – air conditioning and heating in. We offer affordable, industrial and residential windows made with an all aluminum construction. Available in a double and single model, our Storm and Thermo sliders are perfect choices for a utility based application. This durable roof or wall lite is made from long lasting, translucent white fiberglass, surrounded and sealed with an aluminum extrusion on the sides and the ends. The aluminum sides are specially designed to interlock with most metal building panels, or with each other. The sealed air space provides superior insulation over a single skin lite at only marginal extra cost. The roof panels are lightweight, corrosion resistant, leak proof, shatter proof and completely maintenance free. The roof panels are available in standard widths of 16” and 20”. Other widths are available on request. The roof panels are available in virtually any length necessary to match metal building panels. Affordable Industrial and residential windows made with an all aluminum construction. Available in a double and single model, our Storm and Thermo sliders are perfect choices for a utility based application. Choose from an array of glass options including wire glass, laminated glass, tempered glass, 3/4″ sealed units and more! They open and close easily and quietly.